When it comes to buying a new 18” or built in dishwasher , there are more choices today than ever before. Gone are the days of all dishwashers looking the same. Now, you can choose from a variety of door styles to suit your preferences. Today, we will take a look at the full console vs. the fully integrated styles. Both popular choices, these styles offer much versatility in regard to size, color and available features. Full Console: Full console dishwashers are a popular and traditional option, especially among lower priced models. These dishwashers feature a control panel at the top of the dishwasher door, usually about 4 inches high such as the one on this stainless steel Whirlpool full console dishwasher. Fully Integrated: With their sleek, clean style, fully integrated dishwasher doors have recently become very popular, especially in new or newly renovated homes. These dishwashers have controls built into the top of the door, so that only the solid door and handle are visible when the dishwasher is closed. 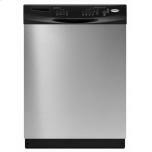 Many of the more quiet models, such as the Bosch 24 inch Integra 500 Series Dishwasher include a small display or light as visual indicators of cleaning status. 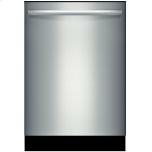 For more information about choosing a built-in dishwasher, please visit Karl’s Appliance at http://www.karlsappliance.com. This entry was posted in Dishwashers, Home Appliance Buying Guides, New and Innovative Appliances and tagged 18 inch built-in dishwasher, 24 inch built-in dishwasher, Bosch 24 inch Integra 500 series dishwasher, full console dishwasher, fully integrated dishwasher doors, whirlpool full console dishwasher by Karl's Appliance. Bookmark the permalink.